You know what phrase I hate? Taking an outfit from day to night. Seriously, I hate it. Maybe, my original outfit is what I want to wear after the sun goes down too. The phrase implies that you need an entire separate wardrobe. So if you’re out day drinking, you need to change bits of your outfit at sundown? Does the fashion police come and arrest you if you don’t?Well if they do, I don’t care! I’m a renegade fashionista who plays by her own rules! Besides, where are we really going, that our day time outfits will not be tolerated? That being said, know your audience (because life is a stage) and know your venue. If you’re going to a nightclub in the meatpacking district, then no, your worn-out and beat-up chucks won’t make the cut. But odds are, the same outfit you were urban exploring in will probably be okay. I was out in Jersey City for brunch and then some galavanting around town. So for lack of better terms, here is my “day to night” outfit transformation. I love pairing sneakers with otherwise “nicer” outfits. Let me be clear. I usually hate sneakers. DO NOT wear New Balance cross trainers with flair jeans you bought in high school (but kudos on being the same size you were in HS!). DO NOT wear sneakers you wear to the gym with casual attire. DO NOT even mix your athleisure. 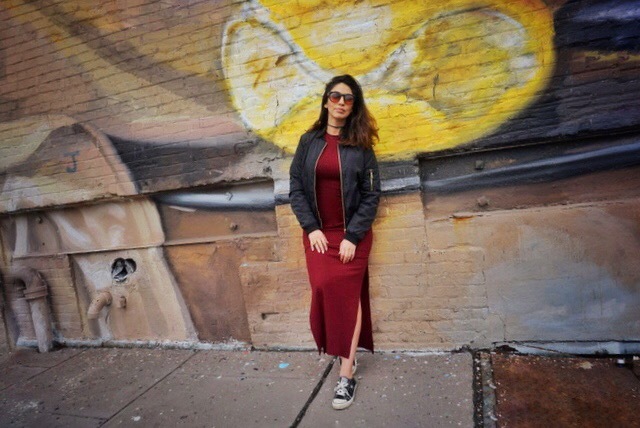 Sneakers you can wear with dresses, skirts, or nice pants are a different breed. Please know, they are not the same. Consider buying the Adidas Superstar Sneaker. They are the on-trend shoe that is being paired with everything from leather pants to chiffon dresses. I personally like the white with black stripes, but they come in an array of colors. If you really want to be the cool girl, try snagging a pair of Rihanna’s Fenty Pumas. Have you seen the velvet wine colored ones? A Good Place to Start: The part of the outfit that will transition you from cool and casual to major Glow-Up. Here, it’s the dress. 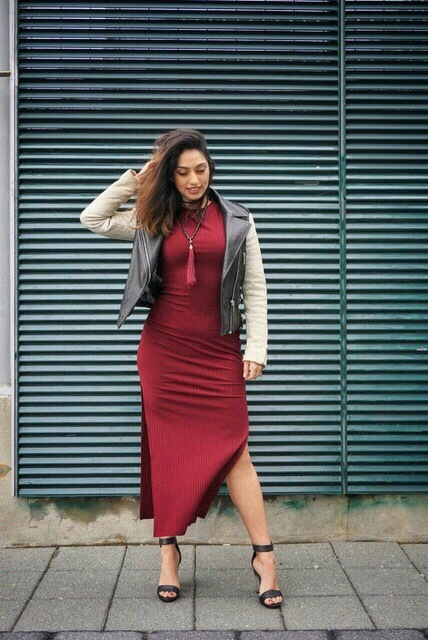 I chose this long sleeved, ribbed maxi in wine red because I knew I would be able to work it several different ways. I paired it with my good old All Star Converses and a black bomber jacket. It was a perfect casual outfit for a quick impromptu brunch. What you’ll wear over and over again: a plain bomber jacket. Bomber jackets are everywhere, and they might feel like a right-now trend. But that is only true if you get a trending color like powder pink, or something full a patches — also a fleeting trend. I found mine on sale (score!) and it’s also lined (double score!). Take a Risk: this might be a funny name for this category, since converse sneakers are not a risk. If anything, they are a basic staple in any closet. However, what I mean is, pair a sneaker with an outfit you would usually put a loafer, bootie, or even heels with. I think it will give you instant street style cred fo’ sho’. What You’ll Wear Over and Over Again: is the dress redundant? Because joke is on you… the item is a killer leather jacket. Mine is a bit of a variation because of the lizard skin sleeves. But if you do not own a good leather jacket, then your closet is incomplete. You need one. If you don’t like wearing skins, then buy a good vegan leather jacket. If you are not about the no blood for vanity movement, then buy a good real jacket. There are plenty of reasons to bargain shop… but a good leather jacket that fits you like a glove is not one of them. This is an investment piece. Price does not matter, just find something that fits you well and makes you feel totally badass like a million bucks. On Repeat: black beaded red tassel necklace. Look at my previous posts… tassels are everything this season, but I have worn this necklace to death practically. Take a Risk: clear block heels. This is a minimal risk, because they are always amazing; ask any stripper ask any Kardashian. They look good with a basically anything. I have owned these for a few several years. I bought them before the clear heel trend was really a thing… so I played it a little safe. They are not totally clear, and have a black-to-clear ombré. But I have worn these to death and will most likely buy a new pair once I retire these. So the common factor here is basically the red maxi. I showed you two different ways to wear it and there are definitely still a few more ways for sure. The key to wearing anything, despite the time of the day, is to make it your own. Maybe you will never need the “night time” version of any outfit. Or maybe, “street style” isn’t your thing. Whatever you chose to define you, own it. Your style is not flawed in any way, shape, or form. I just hope that you will take my words and apply them to your life! Great Post- I have a question! I’m thinking of buying those clear booties that Kim K. and Kendall Jenner have been sporting around. You know, the completely clear ones not just the heel. What’s the best way to wear them?